The restaurant is gorgeous. Sleek industrial chic rules the look. It's casual but polished. The whole restaurant itself seats about 149. There's a bar upstairs facing the waterfront. 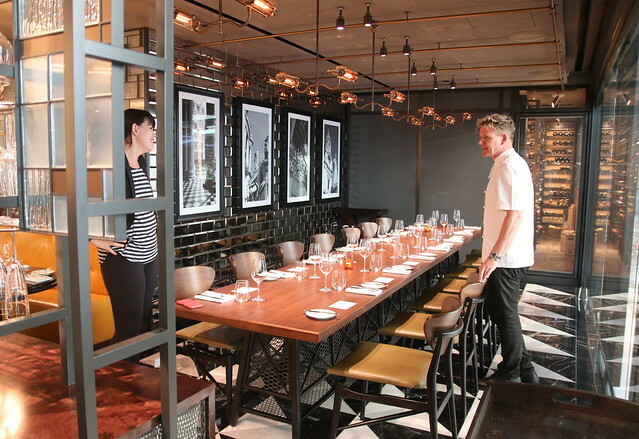 Downstairs, we have this private dining area (photo above) and the lively kitchen dining space (below). Foodwise, you can expect classic British-European fare. 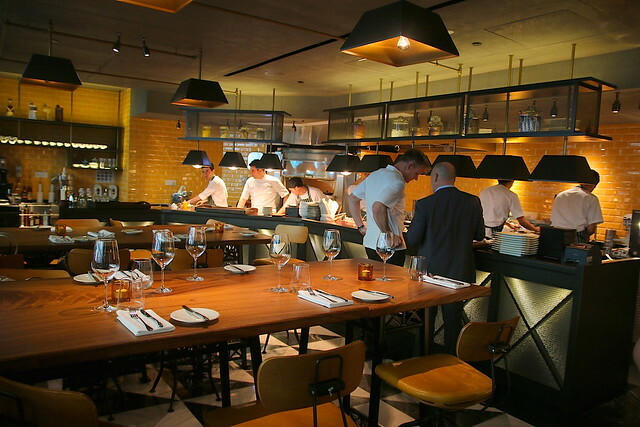 Bread Street Kitchen here will stay true to its London concept, using artisanal British products and seasonal fare, but also tapping on local ingredients for global flair. 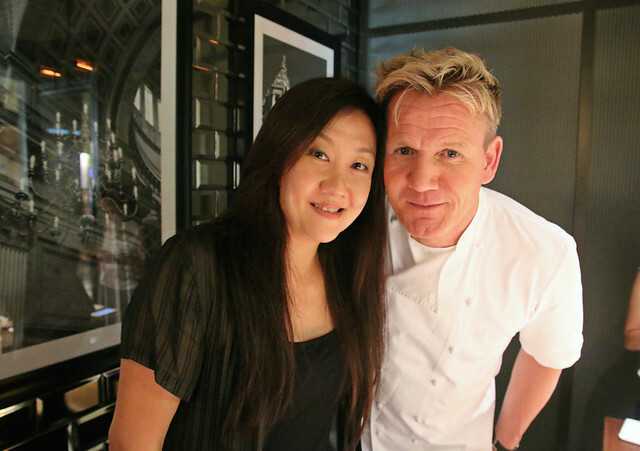 We can expect to see Gordon back in Singapore more often, but he is very confident of the the leadership he's placed here. 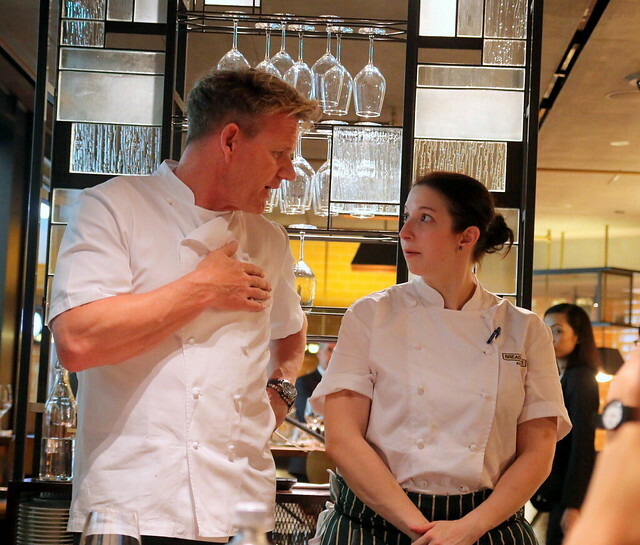 Executive Chef Sabrina Stillhart who has been with the Gordon Ramsay group for a decade, was part of the Bread Street Kitchen opening team in London. She leads the 27-strong team here. I like that their menu is just three pages - do just a few things but do them well. Also, it makes choosing much easier! 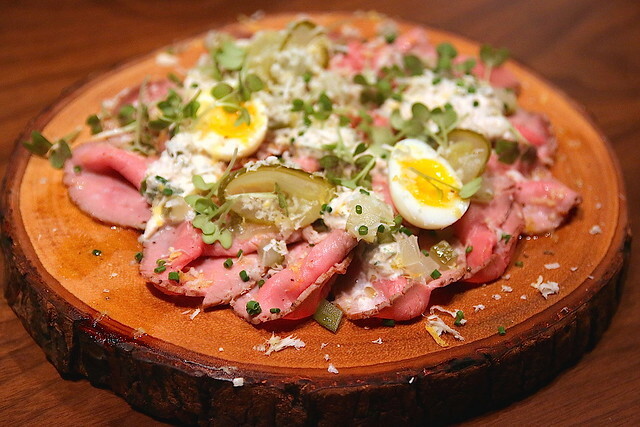 The roasted veal carpaccio with dill pickles, quail’s egg and tuna dressing ($26) is a refreshing cold starter. Tender pink slices of veal topped with creamy dressing, all perked up with the gentle tartness of the pickles. Somehow calls to mind the Italian summer dish of vitello tonato. 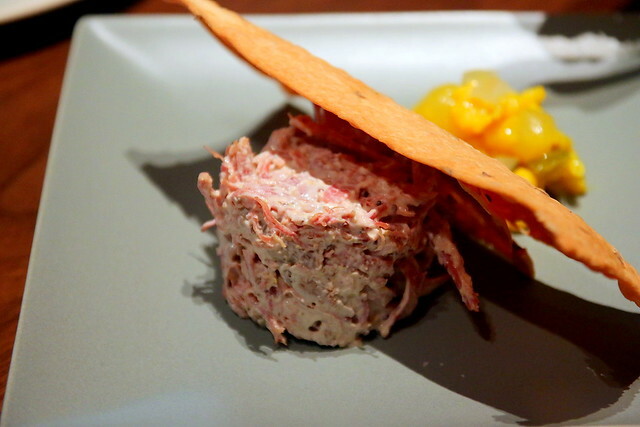 I also liked the potted salt beef brisket, grain mustard, piccalilli, Caraway crackers (S$19) although I suspected the creamy dressing masked some of the flavours. The simple salty slivers on their own would go so well with toast. 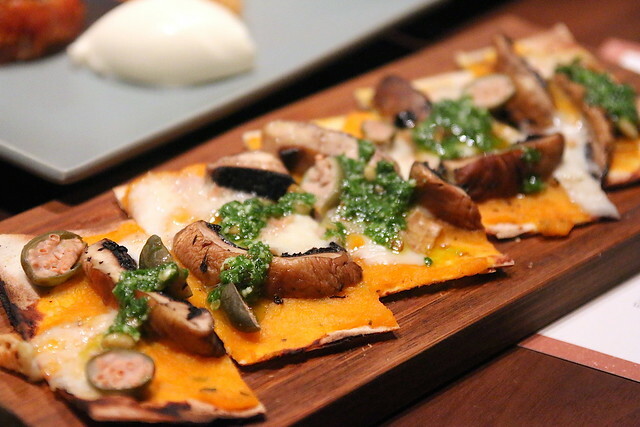 From the hot starters, most of us liked the flatbread with butternut squash, Taleggio cheese, mushrooms, pine nuts, basil pesto (S$20). I shall refrain from skinny pizza comparisons. 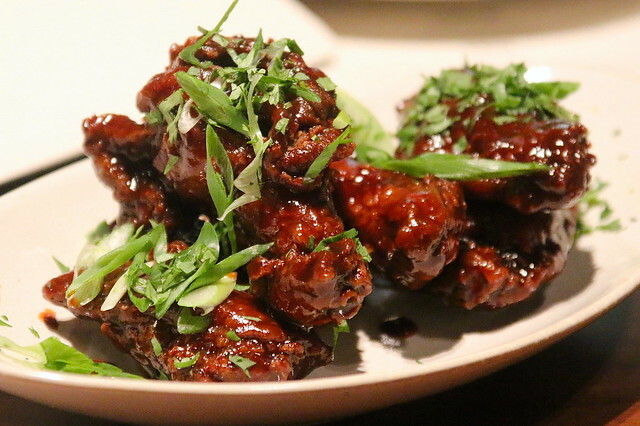 The tamarind spiced chicken wings, spring onions, coriander (S$18) looked promising, but didn't fare so well. Some of us felt it was a little bitter and could do with stronger spice heat and complexity. Good crunch on the batter though. 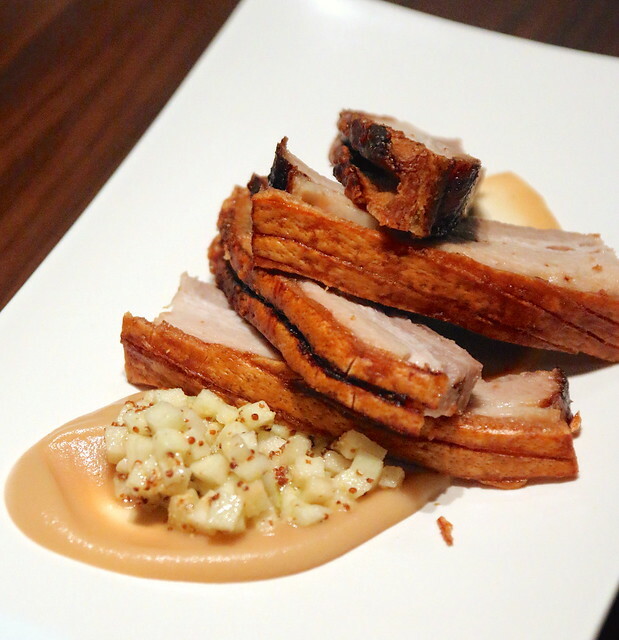 A top favourite was the slow-roasted Dingley Dell pork belly, spiced apple puree. My word, the thick slices of meat had the fat so finely integrated, each bite was a juicy and tender epiphany. The best part of course is the golden brown crackling. This is a steal for just S$28! 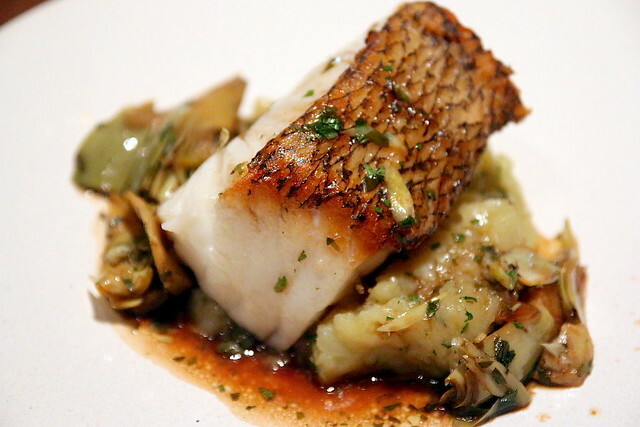 Another winner - the roasted black cod with crushed potatoes, salted capers, artichoke, red wine and lemon sauce (S$44). Cod is pricey but they did justice to this delicate fish. Its rich buttery flavours paired well with the heady sauce. 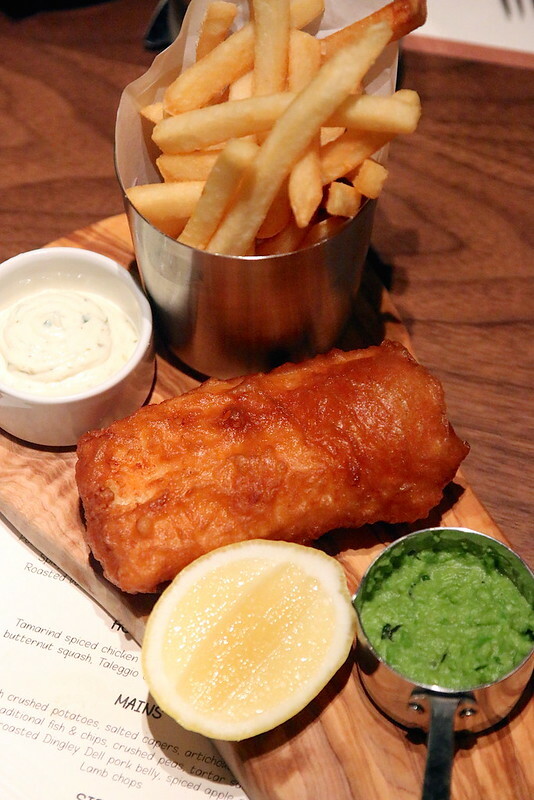 Good ol' traditional fish and chips, with crushed peas and tartar sauce (S$26). A rather modest piece of fish held in crunchy batter. Loved the peas (so comforting) and the fries (pretty addictive). 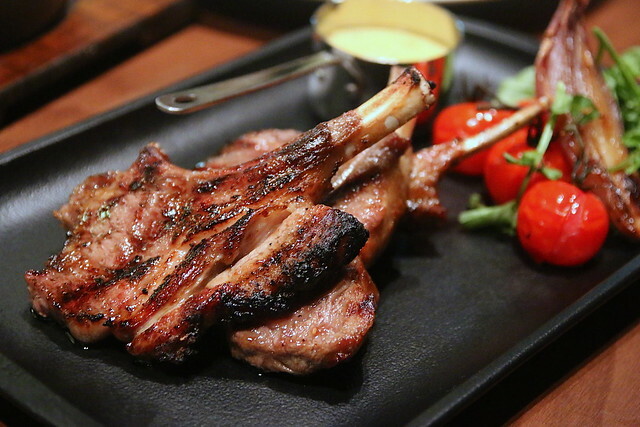 Lamb chops (S$48) from the grill section - nicely seared but didn't stand out in particular. There are some lovely side dishes. 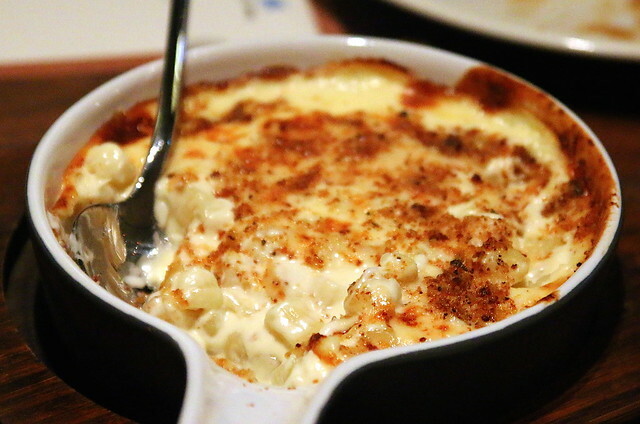 Macaroni cheese with garlic roasted crumbs (S$16) and spiced honey carrots (S$10) beautifully caramelised will take care of your need to nibble. Desserts - what a medley we had. Pineapple carpaccio, passion fruit, coconut sorbet (S$15); Chocolate fondant oozing with salted caramel and mint chocolate chip ice cream (S$20); Monkey Shoulder Cranachan cheesecake with roasted balsamic strawberries (S$18); and a surprisingly intriguing coffee and white chocolate parfait with poached blackberries (S$18). Loved the crunchy flakes on that one. 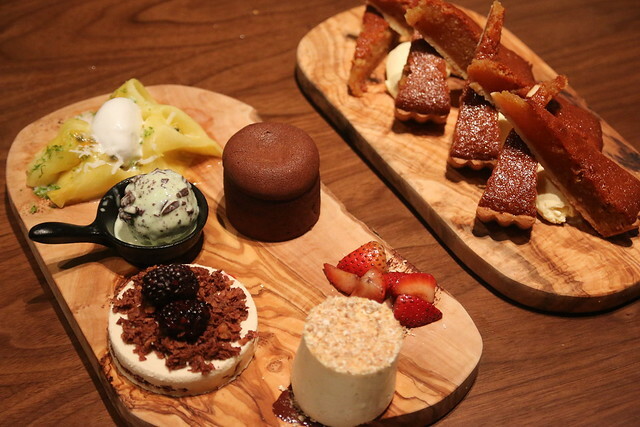 But the treat to beat is treacle tart with crème fraîche ice cream (S$18, far right). Great shortcrust pastry with a sweet dense filling. It's the classic British dessert - suitably old school and nostalgic. "It's the dessert you want to take to bed!" says Gordon. The bar upstairs has an interactive counter where you can talk to the mixologists. And the view facing the Marina Bay waterfront is just spectacular. The drinks here are selected to complement our dastardly sweltering temperature. They also won't be shy with flavours. 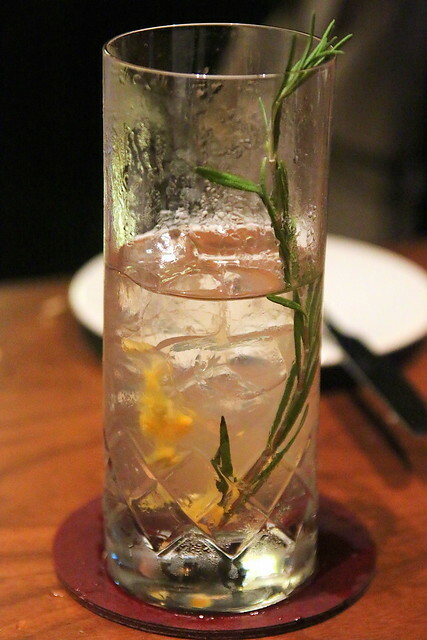 Tio Abuelo is popular; it's their gin and tonic given a twist with passionfruit. 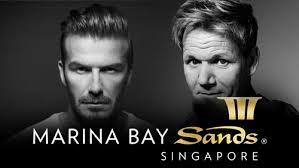 This is my fourth time seeing Gordon Ramsay in person - previously he was here for the Singtel Hawker Heroes challenge. He's extremely likeable in person, bustling, energetic, and always awe-inspiring. Lots more photos from my stories here. I'm glad we have Bread Street Kitchen here instead of a more fine-dining concept. The food is of a reliable quality but it's a more accessible experience. Number of wows may vary depending on your expectations going in, your fan quotient of Ramsay, and how much you miss your university days in the UK. 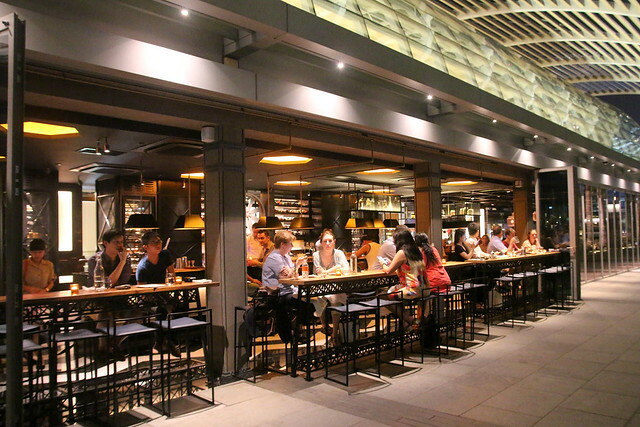 But no matter what, it looks like Bread Street Kitchen already has fans lining up. They are completely booked solid for dinner through July, so try and go for lunch instead.